Procida is a small island in the Bay of Naples in southern Italy, situated between the mainland and the larger island of Ischia. Procida is very heavily populated, with 10,000 residents squeezed into less than two square miles, and it has a more authentic, lived-in feel than touristy Capri and Ischia. The island doesn't have many particular sights of interest, and unfortunately it appears to neglect those it does have. This can be frustrating for travellers, who would be better advised to come here for the island's picturesque, somewhat shabby charm than to seek out cultural attractions. Procida can be visited as a day trip, allowing enough time to see the prettiest views and enjoy a fine harbourside meal, or for a longer stay with time to relax on the beach. Like 'Capri,' 'Procida' is pronounced with the stress on the first syllable. 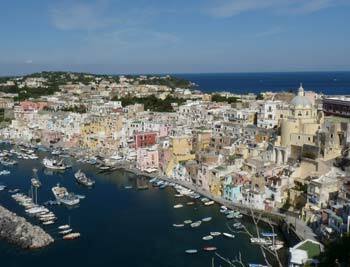 Procida's charm has led to it featuring in a number of films including the classic Il Postino and The Talented Mr Ripley. It has also been used as a literary setting, notably in L'Isola di Arturo (Arturo's Island), a 1957 novel by Elsa Morante which I'd recommend if you can read Italian or can obtain an English translation (try Amazon.co.uk ). Procida has frequent ferry services from Naples and Ischia, and has several good hotels and B&Bs at more affordable prices than other Italian beauty-spots. Procida is volcanic in origin, and several of its curving bays are still reminiscent of craters. The rocky shoreline is all 'ins and outs', though as there are few places where you can walk along the coast, or get an overview of the island, it can be hard to get an idea of Procida's geography once you're actually on the island. At the north-eastern shore of the island is the main urban hub, Procida Porto, where ferries dock and small buses rattle off around the island's road network. The oldest part of the settlement is here, on a defensive high headland. The rest of the island is fairly built-up, though there is also a lot of small-scale agriculture producing fruit and vegetables. Residential dwellings are dispersed all over the island, but at the southern end of Procida is another more concentrated settlement, called Chiaiolella. A small curving islet, called Vivara, lies alongside Procida; it is now a nature reserve. Procida is small enough that you could walk most of the distances on the island. However, its narrow roads are busy with traffic and in places pedestrians have to flatten themselves against high walls as cars and buses pass. It's preferable to get around using the little island buses, which run frequently. These start on the harbour side of the church by the main port, with an additional bus stop stop close to the ferry jetty. You can buy tickets from the driver, though it's cheaper to buy them in advance in a bar or tabacchi - if you're staying on the island, it's worth buying a batch of tickets to save money on travel. Visitors disembarking from ferries arrive first at the Porto. A road runs along the harbourside from the ferry jetty to a leisure marina, passing the island's principal church, Santa Maria della Pietà. Along the landward side of the street are shops, restaurants and bars, with the rest of the town built up the slopes behind. This is a pleasant enough settlement, and useful for shopping and eating. From the church, a picturesque narrow lane climbs upwards to a junction where you turn left to ascend to the Terra Murata. Above the port is the highest and most defensive crag on the island, the site of the oldest settlement, a fortress, a monastery, and - until recently - a prison. Ascending through two stone gateways, you reach a picturesque still-inhabited settlement, the Terra Murata, which means 'walled land'. There are superb views from the road leading up to the walls, and from a panoramic terrace looking towards the Bay of Naples. If you don't fancy walking uphill through the town, you can catch bus C2 from the port to the outer walls of the headland. This is an atmospheric spot, though the most substantial buildings here, the old prison and religious ruins out on the cliffs, stand empty and crumbling. One site that is open to the public is the Abbazia di San Michele, the Abbey of St. Michael. The Abbazia is a curious and intriguing building, and it's well worth a visit. The main church is packed with art, including many representations of the archangel Michael, venerated as Procida's saviour. The atmosphere is romantically decayed; the abbey suffers from a chronic lack of funding. A guided tour continues through lower levels of the abbey, built into the cliffs. Sights include a dusty library, historic nativity figures (recently stolen, then partially recovered), and the macabre spot where important corpses were hung to dry and mummify. Skulls decorate a small chapel, while creaking windows open onto the blue sea. It's an atmospheric tour, ripe with history and neglect. Opening hours are limited; at the time of my visit, the building was open from 10am - 12:30 and from 3pm-5pm except Monday and Sunday afternoons. If you are visiting during the winter months, want to be sure of finding a guide who can speak English, or simply want to confirm the most up-to-date opening times, it's a good idea to call ahead (perhaps your hotel receptionist could do this for you). The voluntary guides are part of the Associazione Millennium, tel. 3397635959/3335996711. 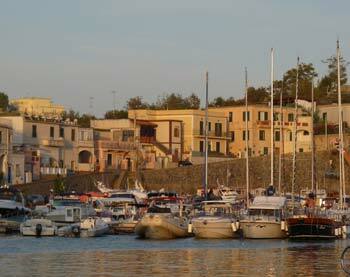 The most picturesque and charming spot on the island of Procida is Marina Corricella. This is a thin sliver of waterfront backed by a cliff made of fishermen's houses - at least, that's the colourful impression. Behind a long fishing harbour, houses were built on and into the rock in a kind of pretty vertical muddle. There are several bars and restaurants in Corricella, with tables attractively scattered along the waterfront, interspersed with painted fishing-boats and harbour cats hiding among piled nets. 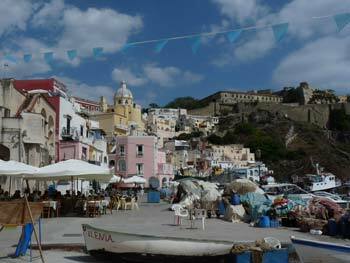 Despite the obvious tourist appeal of the settlement, it still has an 'authentic' feel, like so much of Procida. This is a wonderful spot for a lazy lunch or a romantic evening meal with the water lapping nearby. Unfortunately it is a bit of a walk from the nearest bus routes, and you have to climb up the lanes or steps to leave the settlement, but it is well worth the effort. If you've just visited the Terra Murata, you can take a flight of steps down to Corricella from the road leading up to the headland. Chiaiolella (a real mouthful of a name) is at the far end of the island, reached by buses L1 and L2. The village is pleasant without being wildly picturesque. Its most appealing feature is the location, on a narrow strip of land with a beach one side and a pretty harbour the other. This means that you can enjoy a pleasant short circular stroll along the seaside. The harbour at Chiaiolella has been developed into a large leisure marina, which livens up on summer weekends when Italian families disembark from their yachts for a meal and a passeggiata, or chatter over lively on-board meals. It is also a working fishing harbour, and picking your way through piles of nets along the jetty, you come to a strange colony of cats and ducks as well as good sunset views over the marina. The beach is the island's best (more below). The long stretch of sand is backed by various beach cafes and restaurants, a narrow road and beyond that, shacks and vegetable patches. It's a strange, rather scruffy atmosphere, but appealing. The main street of Chiaiolella runs down to the harbour, and has a reasonable range of small shops. There are two or three restaurants and bars along the harbourfront, a spot where I witnessed the atmosphere shift from dead to buzzing in the space of two hours. Tourist signposts point from Chiaiolella to the small island of Vivara, which is connected to Procida by a long, narrow bridge. However, despite the publicity for this nature reserve, the island has been closed to the public for years - although 'unofficial' visitors obviously clamber over the fence alongside the padlocked access gate. 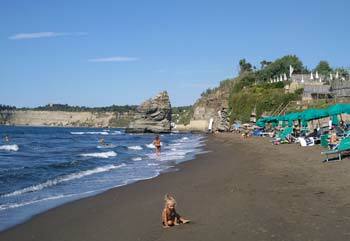 Procida has several beaches, of varying quality. The nearest beach to the port is just a few minutes' walk to the right as you disembark the ferry. There is another small beach on the far side of the big yachting marina, with a flight of steps climbing up towards the old part of town. Although fairly popular, neither of these beaches is terribly appealing. There is a better beach halfway along the island's length, on the eastern shore past Corricella. This beach, called Chiaia, is reached on foot, down a long flight of steps from Corso Vittorio Emanuele. On the north-western shore of the island is Cala del Pozzo Vecchio, a scenic round bay beneath cliffs, where part of Il Postino was filmed. The drawback here is that the cliffs above the narrow beach mean the sand is in shade for part of the day. Pozzo Vecchio is in an unusual setting, just beneath the island's cemetery (catch bus C1 then walk down a narrow lane on the right). Although all these beaches have their merits, if it's sun, sea and sand you're after, I'd strongly recommend catching the bus to Chiaiolella. This has the best beach on the island, long and sandy with attractive views of Vivara and Ischia. There are several beach concessions where you can hire a sunbed, or eat at a terrace above the sand. There is also some free beach. The bus stops right alongside. Once you've seen the sights of Procida and enjoyed some time by the sea, other possible activities include day trips to other islands. Ischia is a 20-minute ferry ride away, and in the summer there are sometimes tourist day trips to Capri. You could also take one of the regular ferries and visit Pozzuoli on the mainland. In the tourist season there are boat tours around the coast of Procida, generally departing in the morning from the port. Ask your hotel or a tour agency for more details, as you should book in advance. The nearest airport to Procida is Naples Capodichino Airport. From the airport, catch a bus to the waterfront (Molo Beverello). Ferries to Ischia generally stop at Procida; the destination will be advertised. There are both fast and slow services, and some run from a different port in Naples, called Mergellina, which is handy for the Italian railway network. Procida is also served by ferries from Pozzuoli, a nearby town on the mainland. There are some interesting Roman ruins in and around Pozzuoli, so it could make an interesting combination with Procida for a holiday. If you are visiting Procida for a day trip, walk up to the Terra Murata and visit the abbey if it's open. Admire the views over the Bay of Naples and of the Procida shoreline. Then head downhill to Corricella for a leisurely open-air lunch by the harbour. In the afternoon, if you have time, catch a bus to Chiaiolella where you can splash about on the beach before returning by bus to the port. 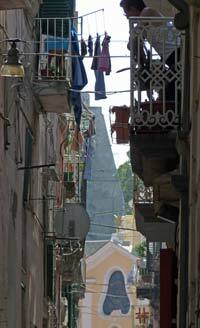 Procida doesn't have many hotels, but the visitor will still find a range of types of accommodation scattered across the island. 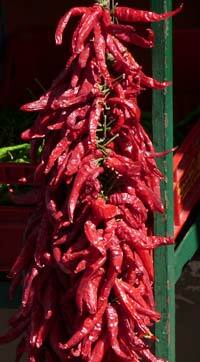 You can find a much better deal here than in many other parts of Italy, especially outside the busiest months of July and August. However, since availability is limited, I would recommend booking some time in advance.